Over the course of the last nine years, Green Lantern writer Geoff Johns has explored and expanded almost every aspect of the Green Lantern mythology; he's given almost every major Lantern, even the ones who were dead or presumed dead, a chance to shine. He's even brought back a number of characters from the dead in order to reintegrate them into the story. G'nort Esplanade G'neesmacher, though, is a character who's never had an opportunity to shine during Johns's run--much to the chagrin of his fans. Rarely seen in the last decade, the character has been generally relegated to the odd cameo here and there, but never actually in the Green Lantern titles. 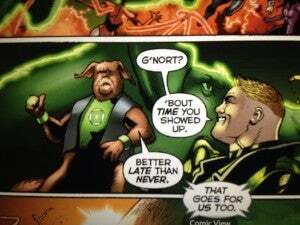 Following the events of the poorly-received Guy Gardner: Collateral Damage series, G'nort (usually played for comic relief) got a grim-'n'-gritty makeover and then vanished more or less completely from the publishing line. As of Green Lantern: Sinestro Corps Secret Files & Origins #1, G'nort was listed as "Presumed Dead." When asked whether the would be making an appearance as a member of the Black Lantern Corps during Blackest Night at San Diego Comic Con 2009, Johns told fans that the character was not dead and was still considered missing in action. When he finally showed up in a Johns-written issue, today's Green Lantern #20, his long absence was quietly acknowledged by Guy Gardner, who told him "'Bout time you showed up."